There’s no denying the equipment you use while fishing makes all the difference. When looking at fishing rods, there’s none other than the Ugly Stik that commands respect and if you ask any angler they’re certain to agree. These versatile, strong, lightweight and durable fishing rods make them highly sought after by anglers that can be used for fishing both onshore and offshore. Ugly Stik spinning rods are best suited for beginners, but some of the most experienced anglers stick with the spin casting technique. These rods are outfitted with a spinning reel which is simple to use and doesn’t require much maintenance. If you’re in the market for an upgrade or looking to replace your rod with one of the best, then the following review is for you. We’ve detailed the Top 5 Ugly Stik Fishing Poles while considering performance, weight, strength, size, price, and a whole lot more. The Ugly Stik Elite scores an impressive 9.8 out of 10 and is by far the one of the most popular Ugly Stik’s out there. This spinning rod was built to last which is something we’ve come to expect from an Ugly Stik and comes with a 7-year warranty for an added piece of mind. This fishing rod is much faster and lighter than the standard rod which is still one of the best sellers of all-time. The Elite spinning rod is available in numerous sizes from 4’ 6” to 7’ 6”. Many users have reported that when outfitted with a lightweight reel it feels like you’re holding next to nothing which is great for long fishing expeditions. The durable design makes these rods great even under load, despite the weight of the rod itself. At these prices, the Elite spinning rod can’t be beat. Another great Ugly Stik is the Shakespeare GX2 spinning rod. 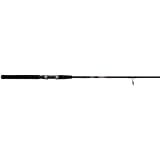 This rod deserves the 2nd mention in this review and excels in performance with availability in a 6, 6 1/2, and 7-foot model. These medium to heavy spinning rods offers superior durability in a 1-piece design and is best suited with 8 – 20-pound test fishing line. The Shakespeare GX2 can accommodate a lure weight from 1/4 – 3/4-oz and has been completely redesigned when comparing it to the older model. The clear tip which Ugly Stik has become so popular with offers improved strength with better sensitivity even to the lightest of strikes. Similar design qualities return which includes the diamond design above the grip and the simple, modern look. A combination of graphite and fiberglass composite gives you years of use with the same great performance which will stand up to time. For those looking for an Ugly Stik with a lighter pound test, then the 3rd option in this review is for you. This GX2 Shakespeare is available in different sizes including a 5.5, 5.84, 6, 6.5, and 7-feet models. 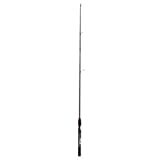 This medium grade spinning fishing pole has an ergonomic EVA handle which is comfortable to use, even for continuous fishing for hours at a time. This GX2 spinning rod is a single piece construction and is at its best when rigged with a lure weighing 1/8-5/8 oz. The smooth matte black finish is accented with a simple red and silver design which gives it a sleek, modern look. Durability, sensitivity, appeal, and value are some of the finer qualities stated by consumers. This Ugly Stik combo gives you the best of both worlds which gives you four styles and sizes to choose from. 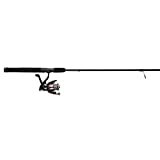 This versatile rod and reel combo is available in 4’ 8” to 7-feet in length along with ultra-light, medium, heavy, and a medium heavy style. With a price that comes in less than many high-performance rods without the reel, this is a great Ugly Stik combo at an even better price. This Shakespeare GX2 spinning fishing combo introduces the first reel by the manufacturer made specifically for an Ugly Stik. Some of the highlight features include soft touch handle knobs, double anodized aluminum spool, and two pinion bearings that help minimize the wear on the internal parts of the reel. Ugly Stik introduced this lightweight spinning rod for those looking for some close to shore fishing in class. This 4-10-pound test fishing rod offers the same amazing qualities of other Ugly Stik’s including strength, durability, and a high level of sensitivity. Available in a lightweight style with sizes including 5.5 and 6-feet, this rod comes in highly recommended for children and adults alike. From beginners to some of the most experienced anglers, this Shakespeare GX2 spinning rod is made of a 2-piece construction. It performs at its best with lures weighing in at 1/8-1/4 oz and is outfitted with a comfortable, durable EVA handle. The graphite and fiberglass construction provides a better balance of weight and sensitivity than other brands of spinning rods. Be sure to ask any questions you have, and if you have any experience with one of these Ugly Stik spinning rods, be sure to share your knowledge with the rest of us below.